“He would forget the kiss, and the awkward s***, and focus on making Nick smile more. 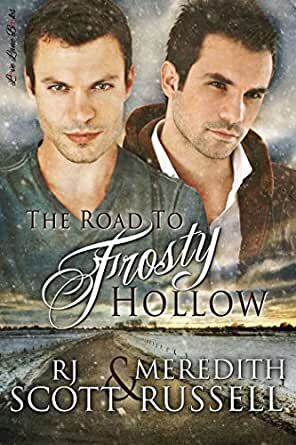 You know where this is going from the start when Cameron (on the left on the cover) picks up Nick for their road trip from Seattle to Vermont to attend the wedding of Nick's sister--who also happens to be Cameron's best friend. These late 20s men grew up together in Vermont, Nick two years ahead of Cameron in school, and Cameron's health issue as a kid and Nick's disappearance into the Marines come into play here beautifully every step of the way. The whole trip is arranged by Nick's sister and it takes almost three weeks for them to navigate through a variety of states, towns, cities and places of interest while their friendship of years past blossoms into the love they've always had for each other. There is a little bit of angst here regarding Cameron's health but in total this book is a surprisingly smooth and totally satisfying journey that you can read in a day or so and come out of it with a huge smile on your face. Which is typical of R.J. Scott. 5.0 out of 5 starsA journey of realization and true love ! Seattle to Vermont. Nick and his sister are going to a wedding, and her best friend Cameron will be there, too. Since their childhoods, the three hung out together, especially while Cameron underwent cancer treatments. Nick is now out of the Marines and is a mechanic. Kaitlin set yup a trip for the guys to travel together, Seattle to Vermont, with planned stops and hotels and sightseeing along the way. While they are on their journey they admit to each other, how much each man cares for the other. Cameron still carries fears of his cancer, and Nick has worries of being free and embarking on a new life. We get marvelous characters, super hot sexiness, and a flowing storyline we love and need. Our guys are deep and thought-filled; plus we know what each one feels, but we are worried they'll be stupid. No cliffhanger or cheaters, just two men on a journey of inner need and realizing it. These two are great together. When you factor in centuries upon centuries of the written word, pretty much every trope is a bit cliche, but that doesn't mean every book reads like a cliche. Well, that's what you have with The Road to Frosty Hollow, past crushes on a road trip together going from point A to point B but the journey, like Nick and Cam, is so much more than the typical road trip story. First off, the journey has many stopping points thanks to Nick's sister who happens to be Cam's best friend, it's more of road trip from point A to point Z. Second, Kaitlin knows exactly what she's doing when she planned the journey, each stop brings the boys closer together. Personally, I love road trip stories because, as in life, it's not always about the endgame but the journey getting there instead. Nick and Cam both have hurdles to overcome and watching them maneuver the road blocks and potholes is rewarding and refreshing. You might just walk away from Road having learned a thing or two about yourself while having fun watching Nick and Cam learn a few things too. This collaboration from RJ Scott and Meredith Russell is amazingly entertaining and extremely romantic with just the right mix of drama and humor. I can't recommend this one enough. 5.0 out of 5 starsRoad Trip to a Wedding, or a Road Trip to Love? What could be more interesting than spending 3 weeks on a cross-country road trip to attend a wedding? Well, there's a bit more to it than that, but that's how the story starts. Did I mention that Cameron is the BFF of the of the bride? Oh, and Nick is the big brother of the bride. Let's not forget that Cameron has had a crush on Nick since puberty... LOL! This truly is an uplifting story of two men who have been through some not-so-pleasant times and how sometimes you just have to yell "screw it" and follow your heart. I used the word uplifting because when I finished this book, the one HUGE feeling I felt was "hope". Thank you RJ and Meredith for giving us another splendid book with characters we grow to care about.